THE National Capital District Commission has invested K48 million to transform Ela Beach in Port Moresby into a beautiful city landmark. 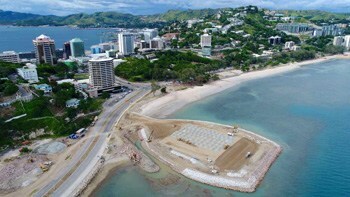 NCD Governor Powes Parkop said the Bank of South Pacific provided a loan to develop the beach as part of the city’s development. “It is part of the large transformation of the city to meet the increasing population’s social and economic demand,” he said. The beach, after it is completed next year, will be in three stretches – one for family outings, one for sporting activities such as beach volleyball and one called the Lakatoi Beach for young people to hang out and have a bit of fun on. The beach will have facilities such as parking spaces, restaurants and cafes. Parkop said Ela beach used to be the best in the city but was neglected. “So we are now developing it to reclaim the glory of the past. The Ela Beach development is a massive investment,” the governor said. “Port Moresby is expanding, physically and socially, economically and the population is almost a million. “Every weekend, the beach is full and there is no parking space. So we are investing funds into the development to have a top class beach which it will benefit everyone. “It is uplifting for our families, city residents and tourists too. “Hiri Moale will have a good place where all the traditional activities will take place.